Each year Disaronno release a new limited edition in collaboration with one of the heavyweights of the fashion world. Following in the footsteps of Missoni, Etro, Roberto Cavalli, Versace and Moschino, this latest limited edition sees the most popular Italian liqueur in the world dressed by Trussardi. 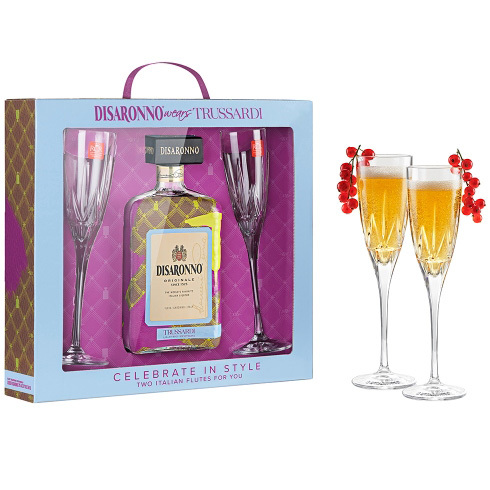 This Disaronno Wears Trussardi Gift Box contains a brightly patterned limited-edition bottle and a pair of crystal Italian flutes, perfect for mixing an Italian Lady cocktail with dry vermouth, Prosecco and a twist of orange peel. Founded in 1911, the Milanese house of Trussardi made its name making leather gloves, but over the last century has branched out into clothing, footwear, accessories and perfumes, firmly cementing its place among the pantheon of greats in the Italian fashion world. That makes this not only a real collector’s item but also a wonderful gift for the fashion conscious. Disaronno, the amber-coloured liqueur with the incomparable taste, dates back to 1525. Original since birth, Disaronno is the Italians best selling liqueur around the world. Smooth, velvety and full of almond aromas. Disaronno is made from herbs and fruits steeped in crushed apricot kernel oil. Disaronno does not contain any nuts.